The Rogue 365 gas barbecue is perfect for the seasoned barbecueer who needs a quality product. 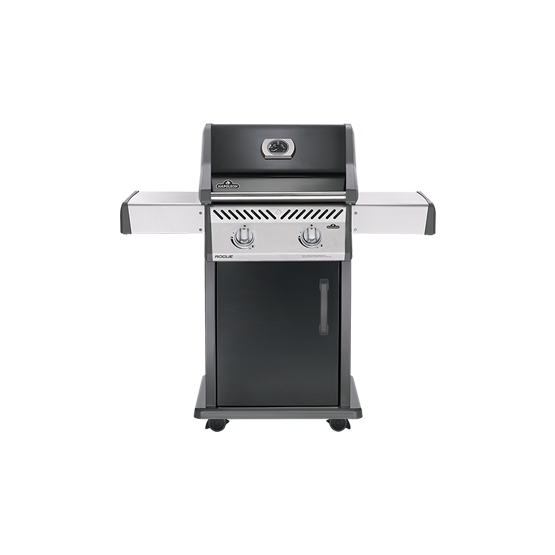 The two main burners on this compact barbecue provide 8.2kws over a 2354 cm2 main cooking area with an additional 612 cm2 warming rack. The Rogue 365 offers a stylish and durable black porcelain enamel lid and single panel door and both side shelves are foldable, allowing it to fit wherever you need. All new garden machinery and barbecues are delivered fully assembled and free of charge if the delivery address is within 30 miles of our showroom. Due to the makeup of petrol, it degrades within 6-8 weeks from purchase so we recommend Aspen fuel alternative in all petrol machinery, which doesn’t contain the ethanol, so won’t degrade, or fuel stabiliser which can be added to your petrol when purchased from the petrol station and slows the process down.